In this 24 Hours to Hell and Back episode, Chef Gordon Ramsay visits Fetch Bistro in Wichita, Kansas. Fetch Bistro are the first and only pet friendly restaurant in the area and owners Pamela and Greg Buss saw a unique opportunity for a new restaurant. However, they have very little experience in the restaurant business and there are no rules or consistency in the restaurant. They have no head chef and a team of cooks in the kitchen and the staff feel like the owners have given up despite the long hours they work. There is no money left and they are close to closing. Gordon arrives in disguise with a group of dog lovers and first notices the lack of rules and dogs are allowed to do whatever they like. They order a mix of dishes for themselves and the dogs. The dog food is put on the table and is scorching hot, too hot to serve to a dog. Gordon notices that the dog food looks more attractive than the human food! The burger is overcooked, the chicken is bland and dry and there are dog and human hairs in the food. Gordon removes his disguise and asks the staff to come into the restaurant. The staff and customers follow Gordon to the Hell on Wheels truck where he shows them hidden footage. The under cover footage from Fetch Bistro shows dogs in the kitchen, dogs fighting close to children, problems with inventory, grime in the kitchen and unsanitary practices. The staff reveal there are no guidelines or structure for the business, they feel like there is no control and they don't even have set recipes for the menu. The customer reviews focus on poor service and problems with food including toxic onions in a pet dish. The renovation has begun and there is a large patio area but it is being wasted. The kitchen staff reveal that the dog food is cooked with the customers food and is actually the same food cooked for humans. Another risk to the dogs health as the food is too rich! The kitchen is inspected by Gordon and grime, old meat and old bananas is found. The walk in doesn't lock, it floods and there is rotten produce amongst precooked dishes. The line cooks argue due to the lack of a leader and they are asked to deep clean the kitchen. 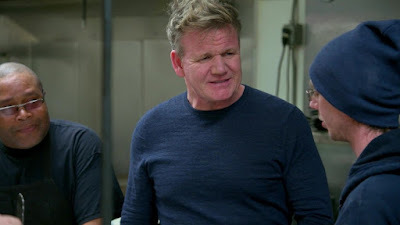 Gordon takes the cooks to the Hell on Wheels trucks to introduce and teach them a new menu and to highlight to Greg that there is 85 years of experience in the kitchen and he is not needed in there. Gordon meets with Greg and shows him footage of Pamela discussing their relationship and Greg talks to Pamela about his feelings. The staff sample the new menu and love the new food. Gordon reveals the new kitchen which is stocked with new equipment and there is a new dog park in the patio. On relaunch night, the customers love the new decor and the new food. Burgers are being returned as raw and Gordon tells them to slow down and keep the standards high. The local food writers and bloggers also love the new food. The staff are happier and more positive and the relaunch is a success. Three months later, Greg is staying out of the kitchen and they are happy with the changes. They have said that the experience was stressful and they worried about how they would be portrayed but that it was a once in a life time opportunity to work with Gordon and that he cared about their success. Fetch Bistro is open and they are overall happy with Gordons changes but aren't sure of the future of the restaurant due to the large debts they have incurred. Yelp Reviews are mostly very positive with the food being a huge hit with customers, with negative comments on some food items and service during the evening service. Trip Advisor reviews are also mostly positive. Fetch Bistro was aired on July 25 2018, the episode was filmed in November 2017 and is 24 Hours to Hell & Back season 1 episode 6.